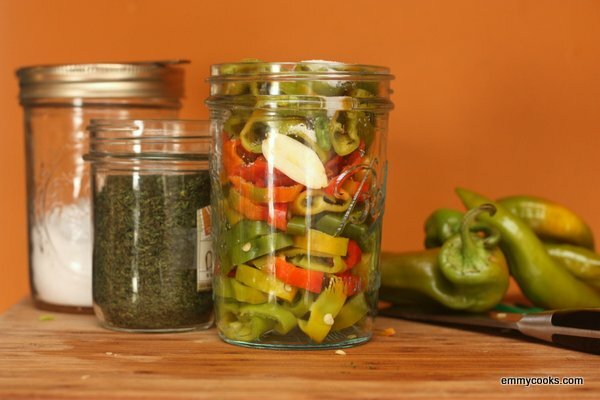 I found this great recipe for pickled peppers at Emmy Cooks that is just what I need this week! While we’re enjoying September’s fine harvest of assorted spicy peppers, why not preserve a few to enjoy when the season is over? Honestly, my standard method for preserving peppers (of any kind) is to slice or chop them, pile them into a freezer bag, and put them in the freezer. But you don’t need a recipe for that, do you? You don’t need much of a recipe for this, either, but I always like to pickle a jar or two of mildly spicy peppers to enjoy in the fall. This a a quick refrigerator pickle, which takes little time beyond slicing the peppers and simmering a simple brine for five minutes. The investment will pay off many times over, since it only takes a few of these pickled pepper rings to spice up any meal. This entry was posted in Commentary and tagged peppers, pickled. Bookmark the permalink.